If you want to have perfectly maintained and blossoming garden area, let our dedicated gardeners and landscapers take care of it. We offer free consultation, advice and many gardening services. They include general cleaning of patios and garden areas, proper cares and maintenance for the plants. 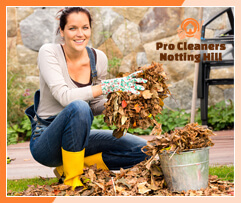 Use our top-notch gardening services that we provide in W11 Notting Hill every day in the week. You can book a free inspection of your garden and we will prepare a free quote to suit your needs. Our gardeners can create the garden which you dream of, laying a new patio, paving the areas and doing the necessary work. They can offer you plenty of patio pavings to choose from. We can create the design which you want for your garden. Our gardening services include installation of new fences and repair of damaged or broken ones. Our specialists in installation and repair will offer you the most suitable options and let you make the final choice. Our gardeners can reduce the tree branches that block you view, remove the deadwoods, cope with dangerous trees. They will trim the overgrown hedges, eliminate the weeds from your garden. Use our professional gardening services that we offer in W11 Notting Hill and make your outdoor area attractive and well maintained. You can take advantage of our lawn mowing services which are available one off and regularly. Our gardeners can jet wash your patio, paved and concrete walkways. They use advanced jet washing machines for this purpose which guarantee fast and properly done work. 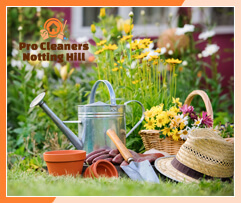 Book the gardening services that we provide in Notting Hill London and let our specialists improve the condition and look of your plants, porch and patio. You will be impressed by the results. Our services are flexible when it comes to timing and payment methods.